According to the U.S National Park Service, it takes a plastic bottle 450 years to decompose in the environment. Yes, that’s 450 years. That means that, if Shakespeare had a bottle of soda pop, that soda bottle would still be around…and it would remain for at least another 50 years. Why does this decomposition process take so long? It’s really rather simple. First, there are two kinds of decomposition, abiotic and biotic. Abiotic decomposition is when material is broken down as a result of a chemical or physical process (like wind or water erosion). Biotic decomposition is when material is broken down by living organisms (usually, this is accomplished by microorganisms). Now then, in plastics, atoms are linked to one another in more complicated ways than ordinary. As a result, bacteria can’t decompose plastics because they can’t break the links. Slower processes can break plastics down, but these processes can take decades or even centuries to do the job (depending on where the object is, like in a garbage dump or in the sea). And in fact, many scientists believe that certain plastics never truly decompose. Since they can’t be broken down by microorganisms, they gradually just turn into smaller and smaller pieces of plastic. Where do these small bits of plastic go? Well, they certainly don’t just disappear. Rather, they end up in other parts of the biosphere—getting consumed by various organisms, embedding themselves in the soil etc. Yet, all hope is not lost. There are some species of fungi that eat plastic (some forms of plastic, anyways). Scientists are working to learn their secrets and develop a solid method for getting rid of our plastic waste. 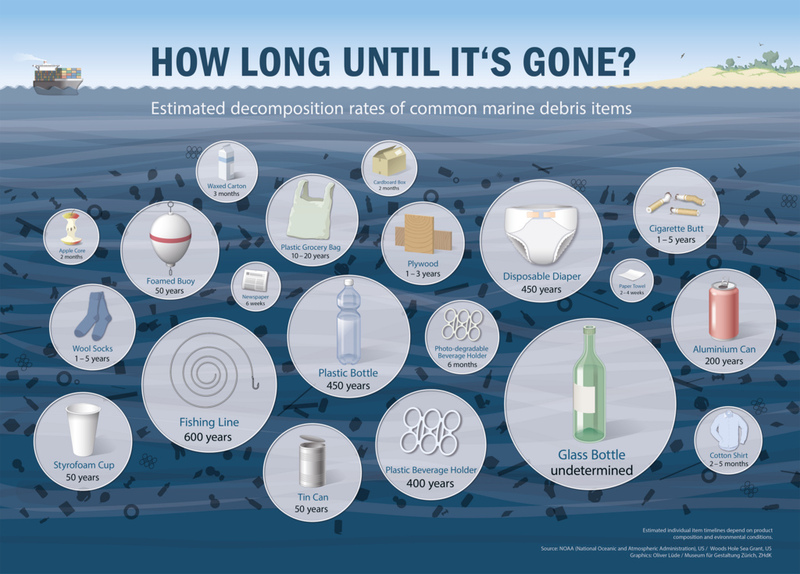 If you are wondering just how long it takes various items to decompose, take a look at the handy infographic posted below. Hopefully, it will make you think twice before buying plastic spoons and cups (seriously, washing dishes isn’t that hard). Note: This is just a quick overview of decomposition and how the process actually works. For more details, please see the sources linked throughout the article.